The Activated Sludge Process is the one of the main in ( sewage treatment ) waste water treatment process. 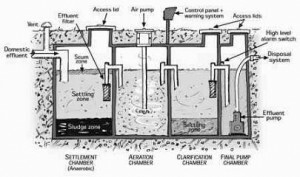 Activated sludge process was developed in England in 1914 and was so named because it involved the production of an activated mass of microorganisms capable of aerobically stabilizing the organic content of a waste water. Activated Sludge Process in waste water treatment is the most versatile of the biological water treatment processes capable of producing an effluent with any desired BOD ( Biological Oxidation Demand ). The Activated Sludge Process is an aerobic biological waste water treatment process that uses microorganisms, including bacteria, fungi, and protozoa, to speed up decomposition of organic matter requiring oxygen for treatment. In this activated sludge process, microorganisms are thoroughly mixed with organics under conditions that stimulate their growth and waste materials are removed. As the microorganisms grow and are mixed by the agitation of the air, the individual microorganisms clump (or flocculate) together to form a mass of microbes called activated sludge. The generation of activated sludge or flocculation in waste water treatment is a slow process and the amount so formed from any volume of waste water during its period of waste water treatment is small and inadequate for the rapid and effective water treatment of the waste water which requires large concentrations of activated sludge. Such concentrations are built up by collecting the sludge produced from each volume of waste water treated and re-using it in the water treatment of subsequent waste water flows. The sludge so re-used is known as returned sludge. This is a cumulative water treatment process so that eventually more sludge has been produced and is available to maintain a viable biological population of organisms to treatment the incoming wastes. In the Activated Sludge Process, waste water flows continuously into an aeration tank where air is injected into the waste water to mix the waste water with the activated sludge, and also to provide the oxygen needed for the microorganisms to break down the organic pollutants. The mixture of waste water and activated sludge is called mixed liquor. The mixed liquor flows to a secondary clarifier or secondary settling tank (SST) where the activated sludge settles out. A portion of the settled sludge is returned to the aeration tank (and hence is called return sludge) to maintain an optimum concentration of acclimated microorganisms in the aeration tank to break down the organics. Since more activated sludge is produced than is needed for return sludge, the excess sludge is discarded or “wasted.” The wasted sludge may be further treated in a sludge digested and dewatered on sludge drying beds prior to disposal. The clarified effluent from the Secondary settling tank is discharged on land or into a flowing river. Return the proper amount of activated sludge for mixing with the wastewater, and Disposal of the excess activated sludge. The activated sludge process (ASP) consists of an equalization basin, PST, an aeration tank, a secondary settling tank (SST) and a sludge recycle line. Raw waste water is homogenized in an equalization basin to reduce variations in the feed, which may cause process upsets of the microorganisms and diminish water treatment efficiency. In the aeration tank aerobic bacterial population is maintained in suspension in the mixed liquor and oxygen, as well as nutrients are provided. Oxygen is supplied either by mechanical or diffused aeration, which also aids in keeping the microbial population in suspension. The mixed liquor is continuously discharged from the aeration tank into a secondary clarifier in waste water treatments ( sewage treatment). Interesting water treatment subjects research. I found your blog on Google and read a few of your other water treatment related posts. I just added you to my Google News Reader. Keep up the great work Look forward to reading more from you in the future. Sometimes I think all this aerobic stuff can actually be bad for us. It puts such a strain on the body. great work….helped for an assignment for water treatment papers!! Please can you privide me with the ASP description. I mean Which type of microorganisms or floc does it have. Really it is a very important process for the treatment of waste water and this process is also easy to carry out. I so much enjoyed the simplicity with which the whole process is therein presented.